A total of over 25GB of post-release stuff to download. Ready for your PS4 or Xbox One's hard drive to take another one for the team? 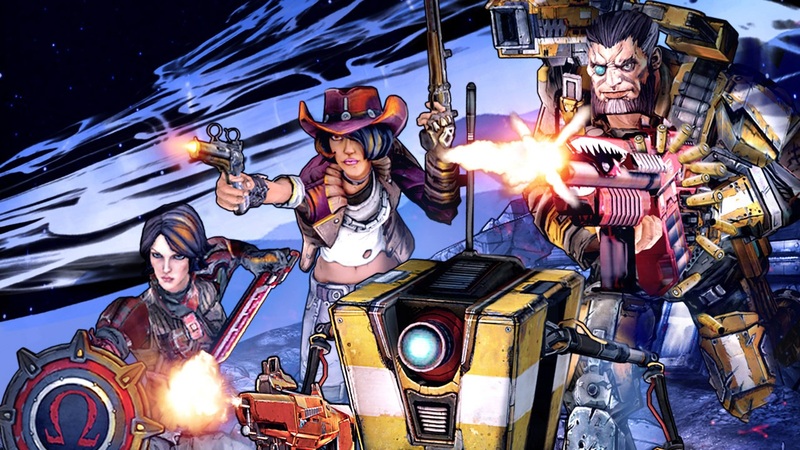 Shortly after the March release of Borderlands: The Handsome Collection, Gearbox rolled out a huge patch for both systems that weighed in at roughly 16GB. Two months later we get hit with another patch, this one around 8GB. Good thing 1.25 inch floppies aren't the storage norm. The patch notes list a lot of little tweaks here and there for both versions of the Handsome Collection, things like performance improvements, glitch fixes, and the like. Nothing terribly exciting as far as gameplay is concerned, but there is a new head and skin combo from Poker Night 2 you can unlock. Borderlands: The Handsome Collection shoves Borderlands 2 and its follow-up Borderlands: The Pre-Sequel together in a tidy high definition package retailing for the price of a single new game. It's the first time both games are available on PS4 and Xbox One, and it's also the first time four player local split screen co-op is available. All DLC, character additions, headhunter packs and add-on content are included with the purchase. Just Got Borderlands: The Handsome Collection? Better Start Downloading the 16GB Patch.